According to Wikipedia, baptism is defined as a "water purification ritual practiced in many of various religions including Christianity, Mandaeanism, and Sikhism. Christian baptism has its origins with the Jewish ritual of mikvah. The word baptize derives from the Greek word βάπτειν …which loosely means to dip, bathe, or wash."
Some religions, such as the Catholic Church, teach that babies must be baptized or christened, usually within the first year after they are born. Others, however, believe that a person should not be baptized until they have reached an age of accountability, which can occur anywhere from the preteen years into adulthood. What Happens in a Catholic Baptism Ceremony? Here again we see quite a difference in how baptisms are conducted. The practice of "sprinkling" drops of water over a baby's head is common in many religions, and this practice is typically referred to as aspersion. Some religions expand upon the aspersion tradition by actually pouring water over the head. However, other religions teach that to baptize is to immerse, meaning the person's entire body must be submerged under water for a few seconds. 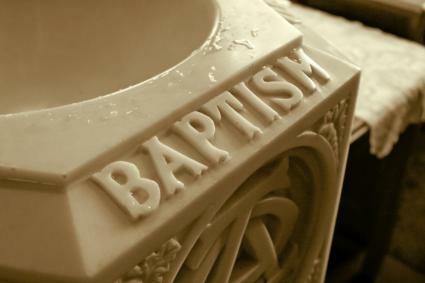 For some, the act of baptism is the act of actually washing away of one's sins. It is a part of the plan of salvation, and these churches believe that those who do not practice it may lose their souls. For other religions, however, baptism is a symbol of their identification with the Lord. Although their salvation doesn't hinge upon baptism, they are showing their intention to live a Christian life. Whatever the case, baptism shows a person's submission to God. Baptism dates back to Biblical times. The incident of John the Baptist baptizing Christ is just one of many examples throughout the Bible when baptisms were performed. Although Jews do not adopt the term baptism, traditional Jewish rites included purification baths, or mivkahs, which were given for a variety of reasons as part of a cleansing ceremony. Will the ceremony be conducted during Mass? Who will be the participants? Parents? Godparents? Churches who do not practice infant baptisms may still choose to hold some type of celebration among the members of their congregation. Although, these celebrations will probably be much more informal. Baptisms are very personal decisions, and if you have any questions concerning baptism, you should contact your pastor, preacher, priest, elder, or deacon to voice these concerns.